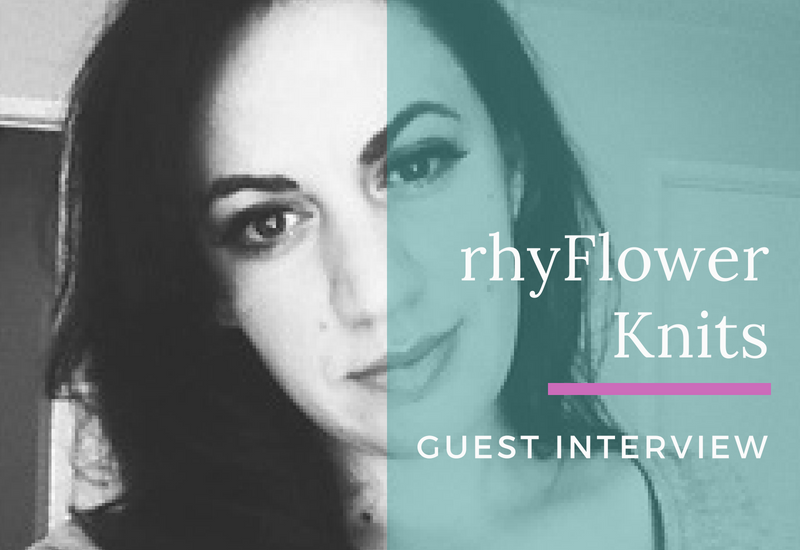 I’m so excited to begin a monthly guest interview feature! There are so many amazing designers in this creative space, and I can’t wait for you to meet them here on Squigglidinks and see some of their incredible patterns! 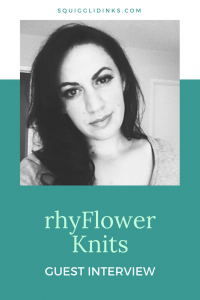 This month I’m beginning with Melinda from rhyFlower Knits. 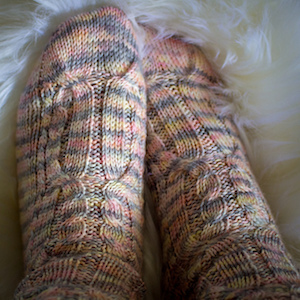 Her knit designs are beautiful—check out her three featured designs after the interview! 1. 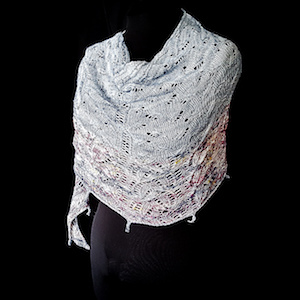 When/how did you learn to knit? I’m constantly fidgeting! When I was 22, I was looking for ways to keep my hands busy so I could sit still. After watching my grandmother knit for years, it dawned on me that it may be a solution to my problem, so I asked her to teach me. I learned the basics, a knit and a purl. 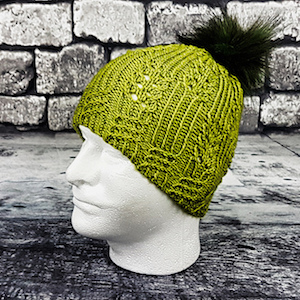 I knit off and on over the next decade until my real passion for it took off over the last five years or so as I learned new techniques, stitches, and more about yarn through Youtube, Craftsy, and various blogs. Now, my knitting goes everywhere with me. I’m constantly striving to learn new things and challenge myself. Designing I’ve been doing over the years, charting things out with graph paper and making it a reality. Designing and sharing the designs with the world I’ve done over the last two years after being asked by fellow knitters how I made things. After much probing from those around me, I wrote out my first pattern. It was terrifying to take this idea and put it out there into the world with the hope that at least one other person likes it. After my first publication, and how rewarding it was to see all the work that goes into it (because there truly is a lot that goes into designing), I was bitten by the bug and didn’t want to stop. Having a lovely knitted item to give to someone. I adore how joyful the people in my life are when they receive knitted items. They understand the hard work and creativity that goes into it, so they’re always honored when they’re the lucky recipient of a finished object. Every stitch is like giving them a piece of me, both of physical and mental labor. Weaving in ends is my kryptonite. I’ve forced myself to become more disciplined about it over the years, but I had been known to have a pile of projects finished waiting for ends to be dealt with. Swatch! When I was starting out as a knitter, I didn’t swatch and I’d get so frustrated when things didn’t fit or turn out as expected. We don’t all have the same tension, knit the same way, use the same tools, etc., so swatching helps keep expectations where they should be since it gives the knitter the means to adjust to their knitting tension. Now, as a designer, I’m on the back end of it. When asking test knitters and such who are having issues with sizing if they swatched first, I’m getting the “no” that I used to give out. Funny how it comes back around. Brioche! It just looks so fun and smooshy. I appreciate the colorwork that can be done with it. I am completely inspired by color. Often, when I see a gorgeous yarn, my brain starts plotting out all the different ways I’d like to wear it, the drape of the fabric I’d like to create with it, the characteristics within the fabric created… the colors speak to me. I’d say another inspiration is my darling friend Janie, who is also the French translator behind my patterns. We often bounce ideas back and forth of how cool a yarn is and I’ll suddenly bombard her with pattern ideas. Knitting multiple objects at the same time (octoarms perhaps!). I always feel like there’s tons of ideas swimming around in my head that I need to get out on some string asap! Check out some of Melinda’s amazing patterns! Disclaimer: Some patterns from designers I feature will be free, others will be paid. I am not affiliated with them nor do I make any commission if you purchase a pattern. My goal is simply to help you find your best next pattern while supporting other designers in this maker community. Thanks for the interview and the reminder to swatch! It’s like being reminded to take my vitamins and do my physical therapy. Even though it is more work it is good for you and your knitting! It is, but it’s worth it when you don’t have to frog hours or weeks of work when you realize that the gauge was wrong! I remind myself of that every time I’m tempted to cut corners and skip it.